What are the origins of trout in Washington State? 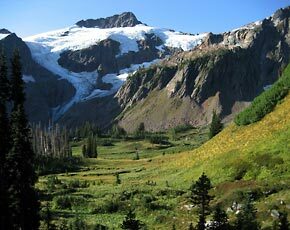 How were the mountain lakes in Washington created? What is the definition of a "high lake" or a "mountain lake"? How many high or mountain lakes are there in Washington? How many high lakes have fish? Of the 4,700 high lakes in Washington, only 1,777 (38%) presently have fish in them. The remaining lakes are fishless for a multitude of reasons. Some of them will not support fish because they are too shallow, or suffer winter or summer kills due to lack of oxygen, or because of other environmental factors. Some are left fishless because good management of the resource and the environment dictates this. How many high mountain lakes are stocked and how many have reproducing populations? Of the 1,777 high lakes in Washington that have fish, about 800 are periodically stocked. The remaining lakes, just under 1,000, have self-sustaining fish populations. (3) The present trend of the WDFW is to avoid self-sustaining fish populations in high lakes. There have been too many examples where reproducing fish populations over reproduce, resulting in large numbers of stunted fish and an environmental imbalance. Therefore each lake is carefully surveyed before stocking to be sure that the fish selected will either not reproduce or be self-limiting. Washington is one of the few if only states to manage its high lakes on a lake-by-lake basis. Who stocks the mountain lakes? Most of the mountain lakes in Washington were barren since the last ice age, so planting and stocking accounts for the bulk of the fish presence. In the early years trappers, miners, loggers, and outdoorsmen carried trout fry from local streams and stocked lakes for food and sport. By 1914, the United States Forest Service (USFS) was stocking many mountain lakes using mule trains. The Washington Department of Game (WDG) was created in 1933 and continued these stocking programs. 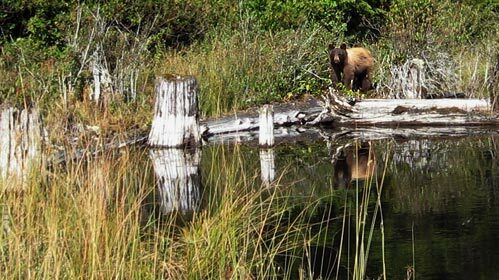 The WDG is now called the Washington Department of Fish and Wildlife (WDFW). The WDFW stocks some mountain lakes directly by aircraft, and a few by truck, but by far the majority are stocked by volunteer groups, under the guidance of the WDFW. Why aren't all the mountain lakes stocked with fish? What kinds of trout are in the mountain lakes? 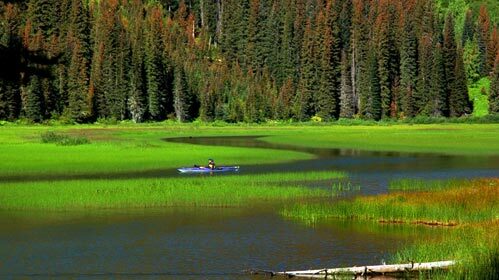 The most common trout to be found in the mountain lakes of Washington are Cutthroat trout, Rainbow trout, and Eastern Brook. Two varieties of Cutthroat trout commonly found are the Twin Lakes Cuts (aka Westslope Cuts) and the Tokul Creek Cuts (aka Coastal Cuts). Most Rainbow trout are of the Mount Whitney variety. There are a few populations of Golden trout, Lake trout, Brown trout, Dolly Varden, Kokanee, Atlantic Salmon, Ross Lake Rainbows, and Arctic Grayling. (3) Of these, only the Westslope and Coastal Cutthroat, Dolly Varden (or Bull trout), and the Ross Lake Rainbows are native to Washington. When it comes to food, trout are typically generalist and opportunists; they will feed upon a variety of prey depending upon what is available. They rely heavily on aquatic invertebrates, primarily larvae of aquatic insects. This includes stoneflies, mayflies, caddis flies, true flies, and at times damselflies and dragonflies. Terrestrial invertebrates such as grasshoppers, beetles, and ants are also prey items. It is typical for one or two sources of food to dominate the diet at specific times on an annual cycle. Although generalists and opportunistic, trout often feed in a very selective manner at any given time. Any serious angler will attest to this! In some habitats, in addition to the aquatic insect larvae, crustaceans such as freshwater shimp, crayfishes, and tiny free-swimming "water fleas" are important food sources. As some trout become larger, they prey on smaller forage fish. These fish-eating trout are usually able to attain much larger sizes. Since the size of the prey is dictated by the gape of the open month, growing past a certain size opens the door to larger prey items and consequently to further growth. How fast do trout grow? Size 2-3" 7" 9" 11" 12" 13" 14" 15"
In lakes with better than average sources of food, it is not unusual to find a 10" trout after only 1 year! How long do trout live? Why do some trout have white meat while others have pink or red flesh? How do fish affect the ecosystem? What does the Hi-Laker Club do to help the fisheries in Washington State? Hi-Laker club members promote no trace hiking and camping techniques, clean up debris left by other people, and provide detailed lake surveys to the WDFW to help it manage the mountain lakes for a quality fishery. or discuss it in our forum. For an online visual tour of high lake fishing see Gerry Ring Erickson's 100+ image slide show 'Introduction to High Lakes Fishing'. Many folks wonder if adding fish to alpine lakes adversely affects the ecological balance. The most important recent scientific document concerning the issue is the so-called Liss & Larson report. This peer-reviewed study examined the impact of stocked trout on the insects, amphibians, invertebrates and plant life that live in high lakes - the native biota. 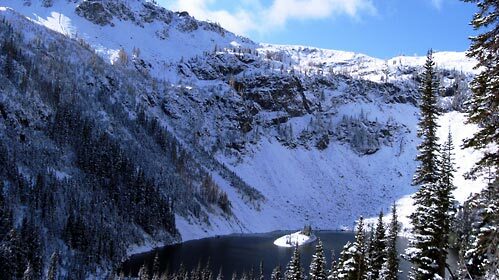 It was commissioned to help determine the future of fish stocking in the North Cascades National Park (NCNP). Stocking is critical for high lake anglers because many lakes would not otherwise have fish. The study took 13 years, 1989-2002, and was accomplished in three phases. The results established that high densities of fish, which occur in lakes where fish reproduce, have a negative effect on the balance of natural biota. But in marked contrast, it reported no measurable differences between lakes that have low densities of non-reproducing fish and those that have never had any fish. In other words, and to many people's surprise, modest numbers of fish have little or no impact on the lake biota. 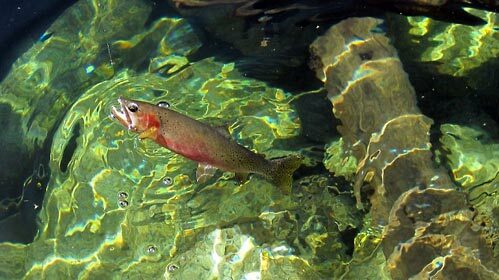 William Liss, Gary Larson and Robert Hoffman were among the principal investigators and edited the report, "Ecological Impact of Introduced Trout on Native Aquatic Communities in Mountain Lakes," conducted by Oregon State University (OSU) and United States Geological Survey (USGS). Consistent with the findings of the Liss & Larson report (as it is commonly known), the Hi-Lakers support "proper" fish stocking in the high lakes with non-reproducing fish in low densities. As it happens, stocking non-reproducing fish in low densities generally leads to a better quality fishing experience, in other words fish that are of a good size and avoiding the unpleasant situation of too many small, often skinny, fish. To a great extent it wasn't until towards the end of phase 2 of the Liss & Larson report that the researchers appreciated the importance of data on non-reproducing lakes for making fish management decisions. "The [Liss & Larson] research found that observed densities of larval long-toed salamanders and of large-bodied copepods [small shrimp-like crustaceans] were significantly reduced by the presence of high densities of reproducing fish. However, effects of low densities of non-reproducing fish were only detectable in small, shallow, relatively warm, productive waters...Based on NCNP research, lakes with low densities of stocked non-reproducing fish would be assumed, in general, to minimally impact the native biota."